These new planets all inhabit another solar system which includes seven planets that have a relatively warm climate, as well as rocky terrain, both of which are promising signs in terms of identifying starting points for the search for both water and life. The planets all orbit TRAPPIST-1, a so-called ‘ultracool dwarf’ star, which unfortunately does not mean that it shares characteristics with Gimli from the Lord of the Rings. Instead, the TRAPPIST-1 star is just a tenth the size of our own sun, and only gives off around a quarter of the radiant heat. The planets are far nearer the sun, too: the one closest in has a ‘year’ (the time it takes it to orbit the star) of a little over one day, and the one the furthest out completes its own annual cycle in only 20 days. 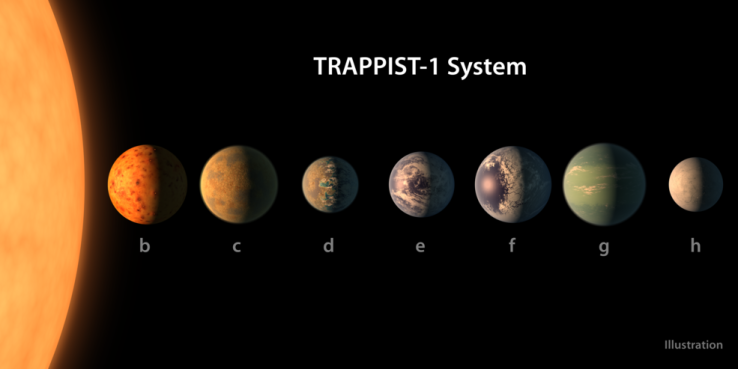 The TRAPPIST-1 system and its terrestrial planets are a huge milestone because before their discovery, we were basically limited to four candidates – one of which was our own. These new Earth-sized celestial bodies were originally discovered when researchers including lead author of the new study Michaël Gillon of the University of Liège were studying the TRAPPIST-1 star they’d been observing since 2015, and noticed decreases in the star’s brightness, caused by the momentary occlusion of the star by the passage of three of the system’s planets across its surface. NASA has also been very quick to temper expectations from observers who think this might signal favorable possibilities in terms of the discovery of alien life – the likelihood is slim, and it’s very early yet in terms of figuring out if the planets have other characteristics they share with Earth beyond rockiness and relative warmth owing to their placement in the so-called “habitable zone” of TRAPPIST-1 – like whether they even have atmospheres and the presence of water or other gases like oxygen. Still, finding this many planet orbiting a star so nearby with even basic Earth-like characteristics is a promising sign, according NASA researchers. It suggests that indeed, as some have theorized, the galaxy could be littered with Earthish planets – far more than we might’ve suspected.